Michael and I took the two Allards to Equinox for the 2018 running and we did the marque proud. We finished 2nd and 4th out of about 30 with Mike in 2nd with the K2 and yrs trly 4th in the J2. After thirty-five plus years Mount Equinox has left myriad memories. The first run to the top in the Allard left me forever tied to the mountain and its miles of twisties and ever changing sights. Breaking the six minute mark was a memorable milestone. I danced a jig at the top when I got the news from the time keepers. Five minutes, after nearly thirty years of trying, was even more satisfying. Sharing the event with my son the last years now has been a joy that very few fathers get to experience. It’s even better than breaking the fabled five minute barrier. Having him beat me has been the icing on the cake. Thankfully - at least until now - he hasn’t improved upon my best time. That will, no doubt, come. There are memories of individual races and individual years. Of the many runs up the mountain the memory that always comes to mind is a run DOWN the mountain. It was sometime in the nineties I think. Kim Eastman in his Kurtis was fighting to break five minutes and yrs trly in the Allard K2 was getting down into the low five minute area. We were among the fastest that weekend, Kim was second behind Bob Girvin in the magnificent Allard GT. My Allard K2 was a place or two behind him. Late in the afternoon on Sunday we were taking a last run ahead of incoming rain. At the summit we could see the rain coming in from the west. There were no more cars to come up. Wisdom had prevailed at the bottom. Given the word to come down we figured we would have to hurry to beat the rain. The ensuing race to the bottom was amongst the most exciting drives on Equinox that I’ve ever experienced. The sound of those two unmuffled V-8s echoing from the trees and reverberating off of the rocks was nothing short of glorious. This year’s runs and relaxation at the top will stick in the memory for other reasons. The top part of the mountain was pretty well shrouded in mist and rain on most of Sunday so the hairpins were getting a bit slippery. Visibility was less of an issue for the last mile as some of us have done this for so long we know what’s coming. We should note that, while the Allards were second and fourth, another father and son team took first and third in a couple of hot SAABs. 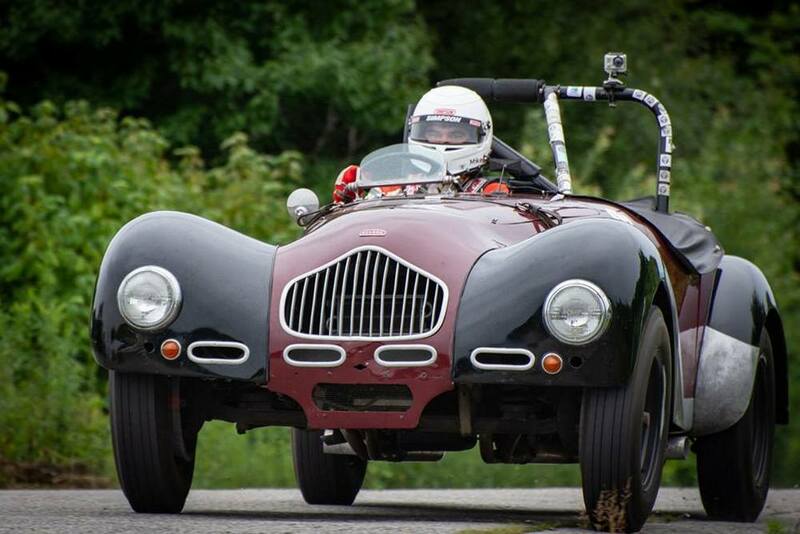 The Allard Team expects to return next year with a focus on getting first and second. Time will tell. Meanwhile, we have a winter of sitting by the fire ahead of us to relive the joy.